Traveling Food Lady: Pasta made easy! You did an excellent job for sure....the walnut sauce sounds amazing!!! 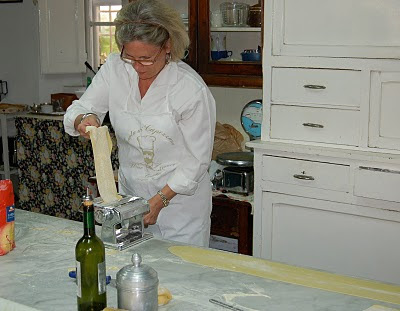 Isn't it fun to make pasta by hand? It's been a little while and my kitchen is kind of in disarray at the moment, but I plan to soon. (I've never been able to get mine that thin, either!) I'm going to save the recipe for walnut sauce - that sounds so good! Nice photo! You reminded me that I have not made pasta for a while: I must correct this. This sounds fabulous with the Parmesan and walnuts. Once upon a time I had a hand-crank pasta machine and enjoyed making my own. I was a very, very messy pasta maker and left a coating of flour on every surface in the kitchen, but it sure did taste good. I bought a pasta machine 7 or 8 years ago and then immediately learned that my future probably did not include a lot of carbs. So it sat unused, until I gave it ti a charity auction. Now I'm on gluten fee pasta, which I really like. But it's fun to read about someone else making pasta!